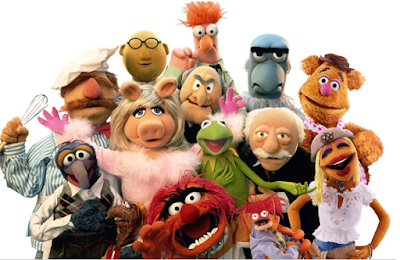 Silly Bee's Chickadees: The Most Sensational Inspirational Celebrational Muppetational! The Most Sensational Inspirational Celebrational Muppetational! So, I can't tell you how excited I am to see the Muppets on the scene! They were my all-time favorite children's characters ever. I loved the Muppets so much that I got my hands on everything I could-- board games, coloring books, figurines, puppets, lunch boxes, tennis shoes. And I never missed an episode, or movie, or Muppet Babies cartoon. Jim Henson was my idol. In fact, my dream was to be part of his Creature Shop. The first time I ever saved my money to purchase anything, it was for a Miss Piggy puppet complete with purple satin gown and gloves. I used to drive my parents crazy by forcing them to sit through puppet shows that I performed from scrunching down in the bathtub! 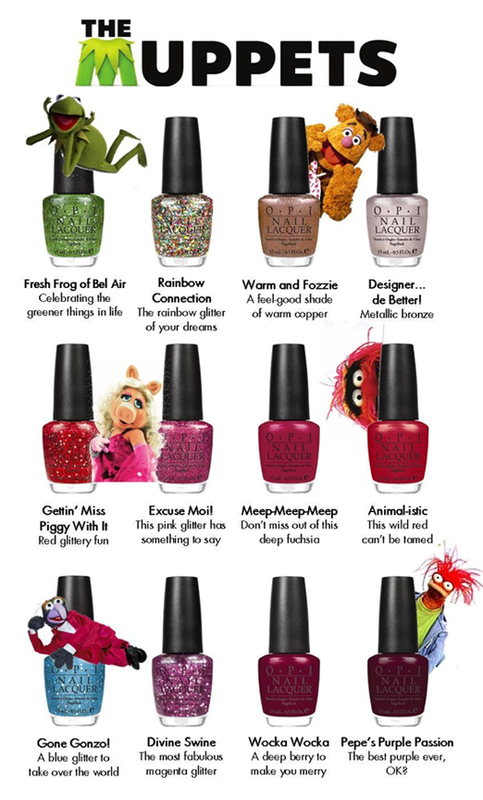 Anyhoo, as excited as I am to see the newest movie, I am thrilled that the nail geniuses at OPI have introduced a Muppet line of polishes! Score! My sister and I checked them out this week and I went home with a bottle of Warm and Fozzie. It's perfect for fall. Warm and sparkly with hints of pink flecks in it. Once I wore it for a few days, I decided to try a matte top coat on it and I LOVE it! It's like a copper suede and my new go-to for November. I'm thinking of going back to pick up Pepe's Purple Passion. After seeing some swatches online, it looks much prettier than it does in the bottle and it's unlike any polishes I already have. Most of the glitters were too chunky for my taste, but they are perfectly in time for holiday parties. I might break down and get Fresh Frog of Bel Air, because, hello! Kermit! 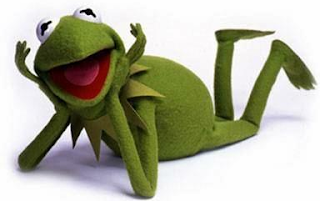 Did you know there is a city in Texas named Kermit? Wocka Wocka. Fer real, look it up!